If you read my earlier PowerBook 100 article, you know that the hard drive in my PB 100 wouldn't work, so it loads System 6.08L into a RAM disk. Well, not anymore. Sure, 6.08L is great and fast, but I needed System 7. And I also needed better portability. It's bulky to carry the external floppy drive around - and the floppy drive is noisy. So I decided to get this PowerBook running. I started with the battery issue. The switch was not a big problem; I simply removed it. So now I could have the battery again. Next, I went for the hard drive issue. I once again tried the drive from the dead PowerBook with no luck. Then I saw a big card next to the RAM card. I never took "PowerBook 100 Guts 101", so I don't really know what it was, but I guess it was the processor card or the cache card. Anyway, I pulled this card from the dead PowerBook and put it in the working one. Now the drive didn't rattle like before, so I booted from a Utilities disk. No luck. I put the old drive back in. Still no luck. So I put in the drive that didn't rattle and did a PRAM zap. I then booted from the Utilities disk again, and to my surprise, Macintosh HD showed up on the desktop! I formatted the drive and put in the Installation disk. 10 minutes later, my beloved PowerBook was running 7.0.1 with incredible speed. It has a stunning 4 MB of RAM and a huge 20 MB hard drive. Not much, but it works. And I love it. I tend to like the "oddball" Apples. Sure, my PowerBook 150 is great, and that Indigo iBook with 320 MB of RAM and AirPort is nice. But still, I prefer my PowerBook 100 and the stock Graphite iBook over these machines. 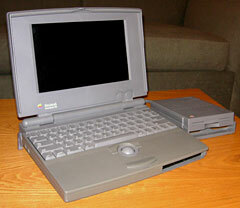 The PowerBook 100 is similar to the MacBook Air in many ways. There were three different 'Books at that time; the midrange PowerBook 140 (MacBook) and the high-end PowerBook 170 (MacBook Pro). And finally the ultraportable PowerBook 100 (MacBook Air). Both need an external drive to install software; and they also lack some ports. The 100 had no modem port, just like the Air lacks FireWire and built-in ethernet. If you buy a PowerBook 100, upgrade the RAM to 4 MB, pronto! 2 MB is not enough under System 7.1. With 2 MB of RAM, you can only run 6.08L and possibly 7.0. 4 MB is such a huge difference, at least under 7.1. So what's my conclusion on this one? Well, it's very very tiny, and it's cheap. Oh, and did I mention it integrates just fine with the other Macs in my Vintage Mac Network?